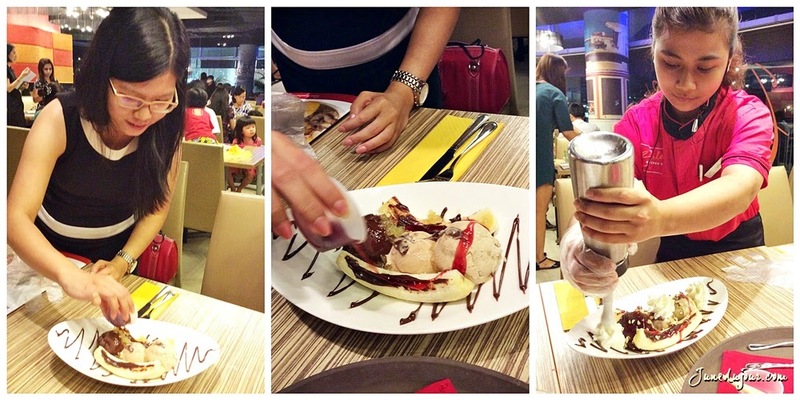 The Sweetest Thing: Gelato Offerings & Desserts @ Earle Swensens! 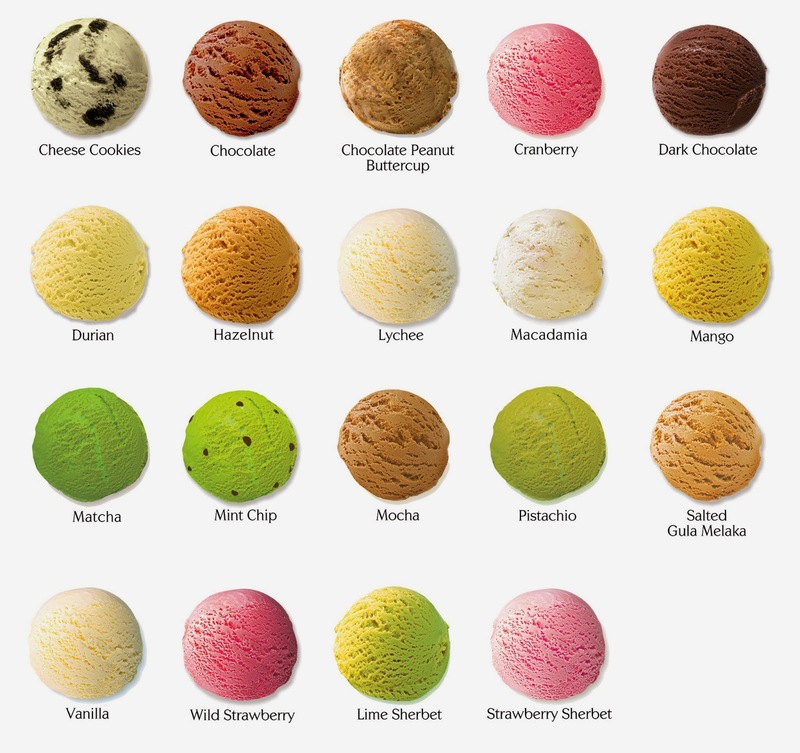 My new year goal is to stay eat cleaner than before and choosing healthier alternatives in my food choices, Gelato is not only much lower in cholesterol level, but it's tastes less artificially saccahrine compared to ice-cream. I had the pleasure on embarking on this sweet journey with Earle Swensens with my fellow foodie Shaylee to join me in checking out their new desserts menu, especially the new Gelato choices! Getting our hands ready for action! 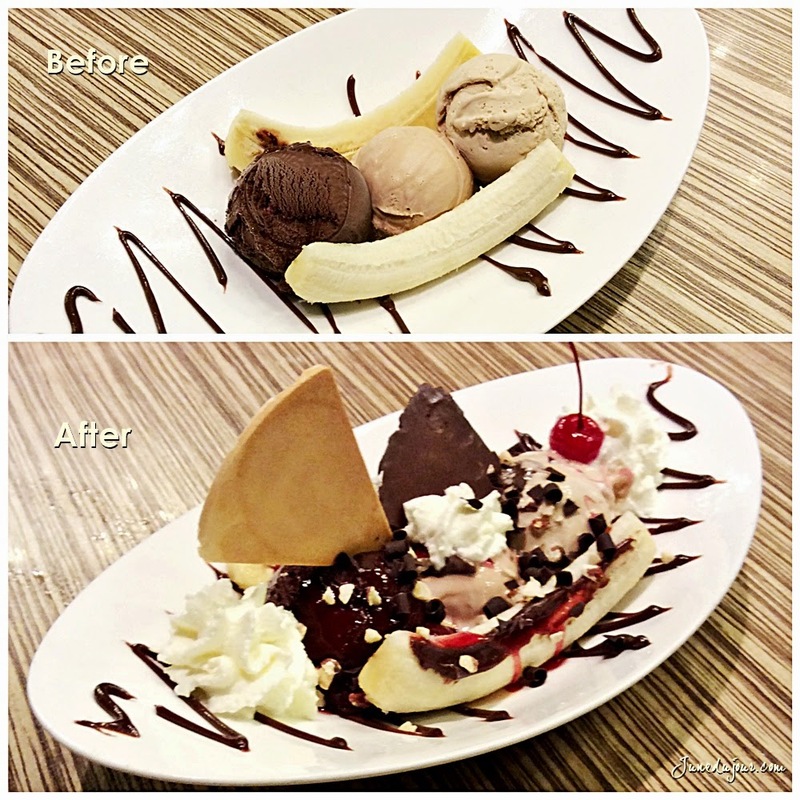 We got to DIY our very own banana split and let me just tell you; it isn't as easy as it looks. Starting off with 3 gelato scoops of our choice (Gula Melaka, Peanut Butter caramel and dark chococlate), I first drizzled (or tried hard to, the paste was too sticky) the chocolate paste. Next, generous sprinkles of chocolate flakes and pineapple chunks on the side. And behold, our 'masterpiece' which we lovingly dubbed as Lady Gaga 2.0 (because during the make I kept calling it our little monstrosity. Kudos to the dessert makers who dish out such great looking banana-splits. after trying it on our own I know now not to underestimate the skill behind it. We also got to indulge in their dinner mains; and being perennial carnivores that we are the choices was unanimous. I had the US Charboiled Black Angus Ribeye Steak ($36.90) which was very well-grilled to that pinkish and succulent medium-rare state that I love. The accompanying vegetable salad was abit soft and overcooked and abit lacklustre in display but nonetheless I'd go back for this in a heartbeat. Its hard to get a good decent steak these days! Shaylee had this Rack of Lamb with Garlic and Herbs ($36.90), which had earned Shaylee a mouthful of praises upon chompd down. The seasoning has melded well in the meat without having the herbs and garlic overwhelming it, the lamp pieces remained relatively juicy to bite and I like that it does not have the gamey smell/taste that occurs when lamb isn't prepared well. 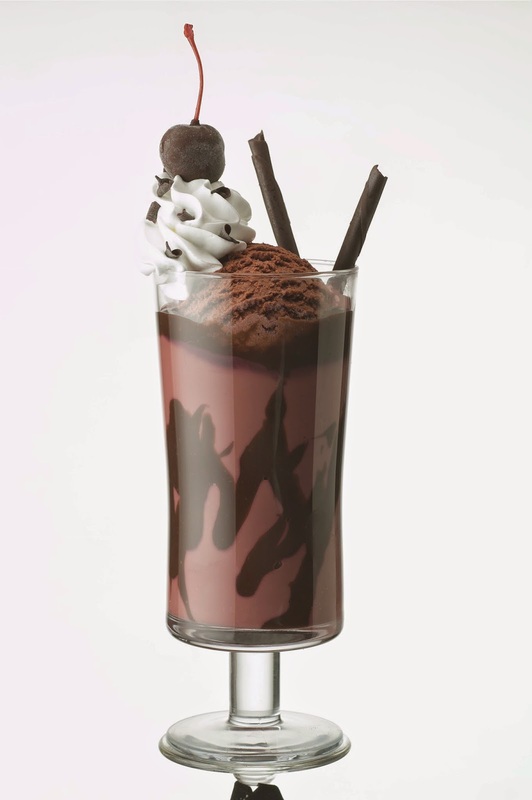 Here are some of the glorious treats that you can expect at a Swensen's near you! Have your cake and eat it (on the go)! 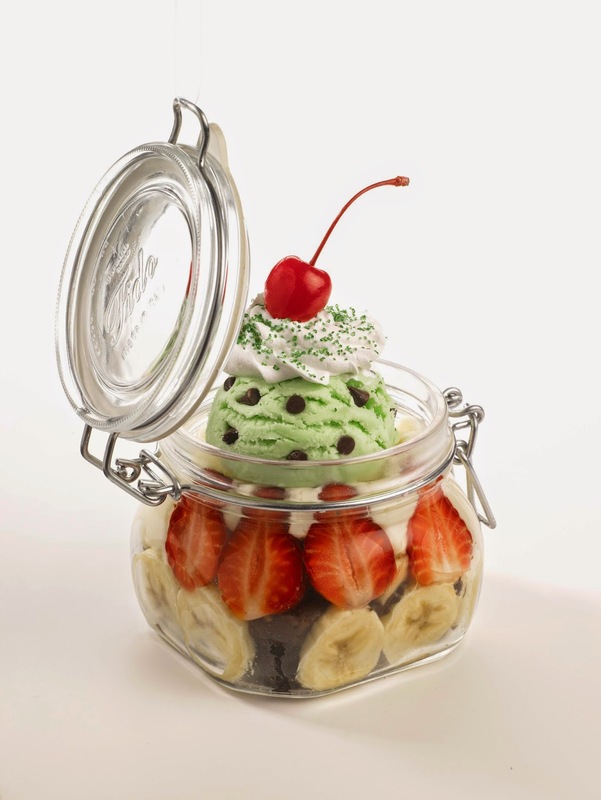 The Joy in a Jar | Joy in a Jar To-go ($13.90 | $15.90) boasts a sinful deep chocolate brownie that is packed with bananas, strawberries, and blanketed over with Vanilla and Mint ice cream; and beautifully set with fluffy whipped cream, maraschino cherry and sprinkles. If you feel like you've met your sweet quota for the day, simply seal the jar and keep it for another day! 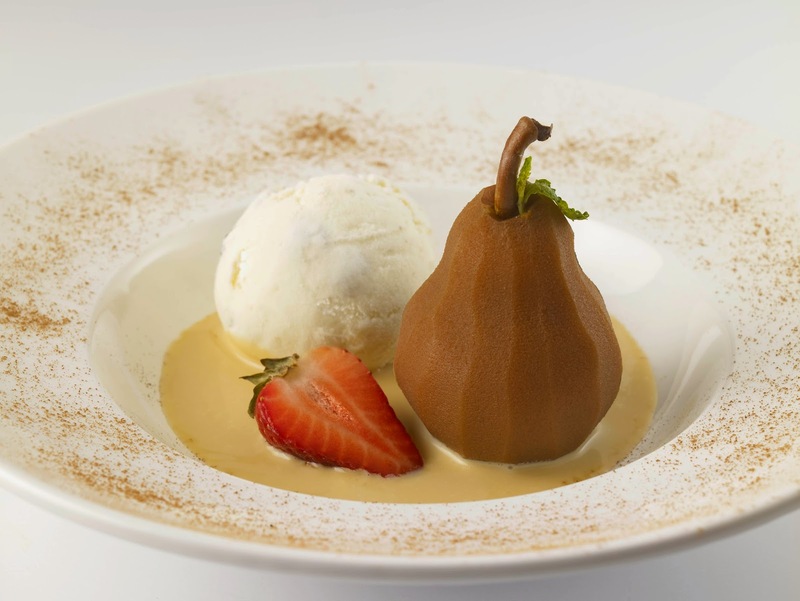 This wallet-friendly yet fine-dining, artisan looking dish is Poached Pear in Butterscotch Sauce ($11.90), featuring a poached pear with hints of strawberry tea, served up with smooth butterscotch sauce and topped with a generous scoop of Vanilla gelato. 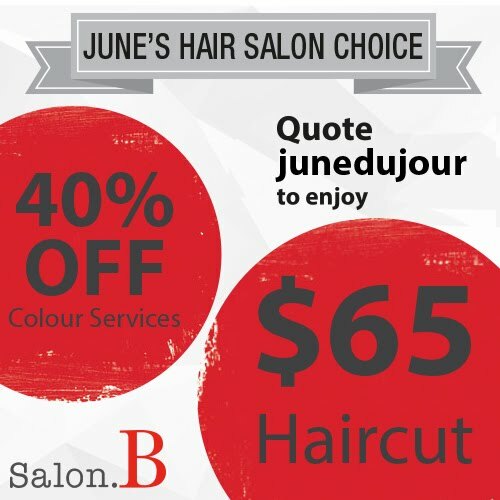 Opera Dark Chocolate ($12.90) is my choice of drink! Dark chocolate heaven with the Opera Dark Chocolate, made up of luscious Dark Chocolate gelato engulfed in smooth chocolate fudge, topped with fluffy whipped cream, chocolate sticks and curls. Though I'm not a cheesy kinda girl, this Cheese Cookie Summit ($12.90) is sure to please anyone; a dollop of smooth Cheese Cookies and Vanilla gelato coated with a luxurious chocolate fudge, crunchy malt balls and a sprinkle of chocolate curls. 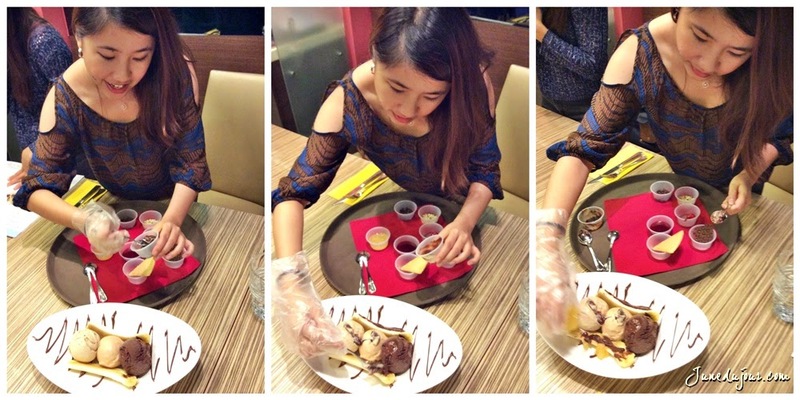 A big thank you to Touch & Earle Swensens for letting as play dessert masters for the day!